We’re seeing the trend literally everywhere. From the super cool girl that served your breakfast this morning, to the red carpet and at every pit stop in between. The bold statement color trend is contagious. Whether you’re stepping outside of the box of traditional hair color and into the realm of bright shades of blue, purple or red. Or instead, the muted pastel versions of lilac, rose gold and mint, you know that these tones are all the same — head-turning, unique and totally rad. The challenge that we see as a Top Indianapolis Hair Salon is the fact that our guests, unfortunately, get a very unrealistic idea of what it’s like to rock these colors in real life. When you see Kylie Jenner sporting her signature bold, teal, blue on the cover of ‘Seventeen Magazine’ or when Nicole Richie debuted her gorgeous, lilac locks for the first time, of course, everyone covets these tones for their own hair. We see a huge influx of guests visiting the salon after a big-named celebrity takes a bold color plunge because the guest latches on to the idea of copying the highly coveted trend. What the guest is unaware of, is the fact that right before Kylie Jenner had her magazine shoot, she was more than likely stepping out of the salon with her fresh color. You’re seeing these celebrities just hours after the color application, because they obviously have the financial and schedule means to have the color constantly touched up. ‘Fashion Tones’ is the nickname that we’ve used to dub bright unnatural shades, or soft, fabricated, pastel colors. Since these fashion tones; blue, pink, purple, green or any color you can invent with the color wheel, aren’t natural tones found living in the hair, they also do not remain in the hair. Visit a salon to try out a super chic rose gold tone that you saw in a fashion magazine, and you will likely see no evidence of that color remaining in your hair two weeks later, at a maximum. These tones simply do not cling to the surface of the hair because they are unable to fully penetrate the hair shaft in the first place. It is important to consider the fact that if bold hues are what you are seeking, you will absolutely have to have the color maintenanced at least every two weeks, or longer. A good rule of thumb is that the darker the selected fashion tone, the longer it will last. Deep, bold purple is going to last you a bit longer than a muted soft lilac. Another ‘Fashion Tone’ factor that is often overlooked is perhaps the biggest setback of them all, even more so than the fact that you will undoubtedly be dealing with some major fading, rendering this trend extremely high maintenance. Celebrity hairstylist, George Papanikolas, who regularly works with the Kardashian and Jenner gang amongst handfuls of other widely popular stars, warns against the major damage that can be incurred when going for a fashion tone. 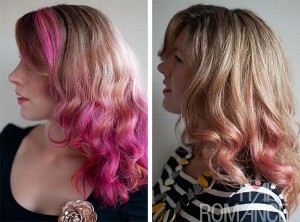 “You need to know that when doing these vibrant colors, it’s necessary to pre-lighten the hair to a pale blonde. It’s easy if your hair is naturally light. For darker hair it puts more stress on the hair to get the pale tones.” Many guests do not realize that their hair has to first be pre-lightened with the use of a bleach product, in order to achieve most of these tones. If you attempt to apply a fashion tone over top anything darker than that tone, you will simply not see any result, or a muted, mucky version of the desired tone. Damage is definitely a major factor to take into consideration. The application of the fashion tone itself causes little to no damage at all, especially if a quality color line is used, as opposed to one with more of a metallic base. However, the enlightening with a bleach product, as we all know, can always cause a level of damage, especially if the desired tone is a pastel, which means the hair must be extremely light, almost a white blonde, to achieve the soft tone. This photo is perhaps one of the most well-known, highly circulated images of a digitally enhanced stock photo. The lilac color seen here was clearly superimposed onto the model’s hair. If you look to the right of her hand, you’ll even see the remnants of her blonde hair that was left out of the enhancement. Absolutely gorgeous color, that is absolutely fake. Lastly, I want to address the fact that just like you’ve always heard; What you see on TV or printed in magazines, isn’t always as it seems. Many times, we have guests bring in a photograph of a fashion tone that they are seeking out on a celebrity and they don’t realize, or can’t identify the fact that the image has actually been digitally enhanced. Or, many times, celebrities use colored hair extensions to accentuate the bold tones that you are seeing them wear. George Papanikolas admits that Kylie’s teal blue hair is often predominantly achieved with the use of hair extensions.Kylie actually endorses her own brand of teal hair extensions from the brand Bellami Hair, called Kylie Hair Kouture, which you see her wearing often. The above two photos of Kylie Jenner do a great job at displaying the difference between her natural hair versus the addition of her hair extensions. See the difference in the vibrancy, and the lack of fading in the second frame versus the first? By no means, do I wish to steer you away from going after these fun and unique color trends, but it is so important to us here at G Michael Salon to convey complete honesty to our guests prior to moving forward with a color service. This transparency is important because just as you will discover with most salons, the price point of these services will not vary or decrease due to their lacking longevity. It’s important to understand that our stylists are paid by their time spent, so they must be compensated for each hour they spend behind the chair with you. Whether that time is spent to create an all over natural brunette tone, or an electric green, the same time is spent. Also, these fashion colors cost the same amount, in salon quality form, as their natural counterparts. Any additional questions you may have prior to making the bold color trend plunge should be directed to your stylist during your consultation, as he or she will be more than happy to discuss the possibility of potential outcomes for your desired tone.